The tradition continues! Also this year our club put together a nice display of fine automobiles at TY Park in Hollywood. 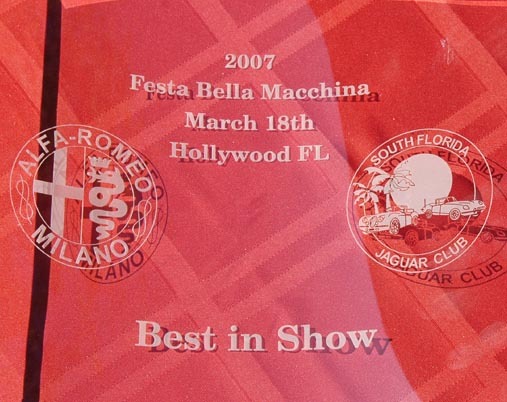 This year's edition was co-hosted by the South Florida Jaguar Club, an alliance forged through the reciprocal passion of Jaguarista Supremo Pascal Gadamer and Alfista Lady Naomi. Many thanks to both for setting up the event and congratulations for attracting not only Alfas and Jags but also a nice selection of British royalty, exclusive and superfast Teutonic machinery (Porsche RUF, BMW Z8) as well as American iron. Best of Show was awarded to a well-deserving, custom built RUF Porsche Carrera. Click on the picture to access the gallery.